Apogee's Duet for iPad and Mac lets you effortlessly capture brilliant recordings on your iPad. The slim design fits right on your desktop, and the iOS/USB connection makes it easy to connect to Macs and iOS devices. Duet includes a sturdy breakout cable that keeps your desktop organized, putting your 2 in/4 out connectivity where you need it. The next gen AD/DA converters provide stunning audio with up to 24 bit/192kHz resolution. If you're looking for a premium interface for your iPad and on the go sessions, the Apogee Duet for iPad and Mac is an unbeatable choice. You get outstanding sound quality, the right I/O, and workflow features that help you get the top level results you want. 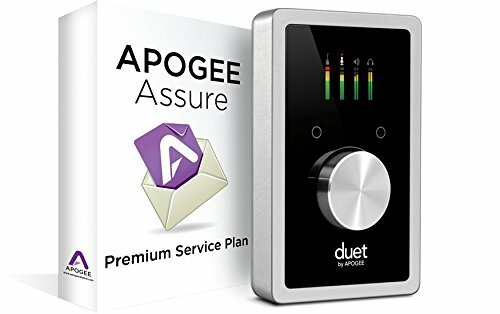 The Apogee Duet for iPad and Mac offers a full color OLED display that gives you visual feedback for a number of functions, including metering, input/output value levels, muting, phantom power, and more. All of this information is also available in the convenient and well designed Maestro software for iOS. Beyond that, the Apogee Duet features two configurable touch pads, located on either side of its main encoder knob. Use them to quickly access output functions, assigned through Maestro 2, such as "mute outputs," "toggle headphone source," "dim outputs," and beyond. Much like its mic press, the Duet's AD/DA converters are the result of Apogee's no compromise design, giving you the best possible audio and monitoring quality. Duet's advanced circuitry and state of the art components deliver a streamlined signal path. The result: Amazingly transparent sounding recordings.